NEWPORT, R.I. - Not surprisingly, the UConn football team was predicted to finish fifth in the East Division of the American Athletic Conference this season in the league’s annual preseason media poll. And its opponent for this season’s opener is expected to once again steamroll the competition. The poll was released this morning as part of the American Conference’s Media Day. 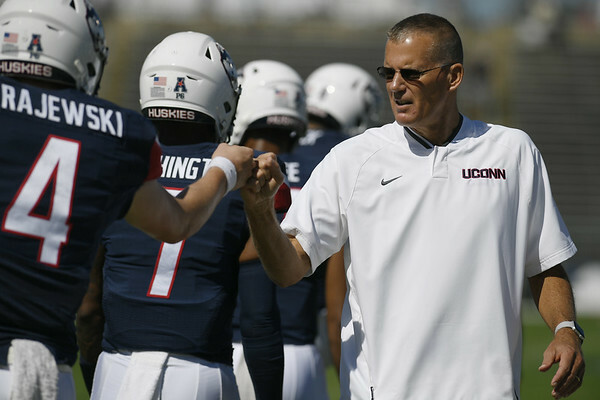 The Huskies, who went 2-6 in league play last season and were 3-9 overall in 2018, are about to begin the second season of Randy Edsall’s second stint as UConn head coach. Central Florida, the defending American champion and self-styled defending national champ, was predicted to win the league again this season. The Knights received 19 of 30 first-place votes. The Knights were also the pick to win the East Division, ahead of South Florida, Temple, Cincinnati, UConn and East Carolina. Memphis was picked to win the West Division and also was the second choice in the league overall, picking up seven first-place votes. UConn will begin the 2018 season with an Aug. 30 matchup at Pratt & Whitney Stadium against Central Florida. The Knights went 13-0 last season and though not allowed into the College Football Playoff, declared themselves national champions. UCF finished No. 6 in the Associated Press rankings after a 34-27 win over Auburn in the Peach Bowl. Josh Heupel takes over as the Knights’ head coach this season after Scott Frost departed for Nebraska. But the Knights return quarterback McKenzie Milton and 13 other starters from last season. UConn has been predicted to finish near the bottom in each of the American’s previous five seasons of play, including sixth in the East last season. Former UConn safety Obi Melifonwu was among those named Monday to the American Athletic Conference’s Fifth Anniversary football team. Melifonwu, who was a first-team all-AAC pick in 2016 and who currently plays for the NFL’s Oakland Raiders, was the lone UConn player on the 30-member team. Voting for the team was done by fans, media, and the conference’s football programs. Two active players were named to the squad: Houston defensive tackle Ed Oliver, the 2017 Outland Trophy winner as the nation’s top interior lineman, and Memphis return specialist Tony Pollard. Navy’s Keenan Reynolds, who finished fifth in the 2015 Heisman voting and who is the NCAA career record holder for touchdowns, was the team’s quarterback. The linebacker corps picked for the team should be familiar to UConn fans. Tyler Matakevich, the Stratford native who was a standout defender for Temple and always seemed to play his best against the Huskies, made the list. As did Shaquem Griffin, the UCF linebacker who despite having just one hand was the league’s top defensive player in 2016. Posted in New Britain Herald, UConn on Tuesday, 24 July 2018 19:21. Updated: Tuesday, 24 July 2018 19:26.